If you are looking for an Android emulator with performance and speed in mind, then Droid 4X should be on the top of your list. It offers a seamless experience of running the world’s most popular smartphone operating system in your Windows PC. After downloading it for free and installing it in your system, you will find that it’s simple, it has all the features you’d want in an Android emulator and did I mention that it’s free? If you are interested in getting this free software, then head on to their official website. You will find the link to get it as “Download Simulator”. It will download the installer to your computer. Next, you will have to double click and open the Droid4XInstaller.exe file. Give it the necessary permissions and it will begin to copy all the files. It did take a few tries for me to set it up as the downloads seem to stop abruptly for me. Once the setup process is complete, open up the new piece of software that is on your PC. If you have been using other Android emulators for PC and Mac, you will find that this one is considerably fast. It doesn’t seem to slow down the computer or take a lot of memory. I’ve had this problem with other emulators. In your first run, you will get a short intro and then will be asked to add a Play Store account. You can open a new Google account or use an existing one for it. You might be required to do some verifications to make it work. The home screen or the first screen is brightly themed as opposed to the dark themed Android setups. You will only find a few apps i.e. SysFolder, HelpCenter, Google Settings and the always useful, can’t live without it—the Play Store. It doesn’t come pre-installed with any bloatware or apps that you do not need, not yet and not ever; let’s hope. The Sysfolder has the default system apps like Gallery, Browser and the Settings which shows Android 4.2.2 as of now in the About phone section. Finally, on the bottom right, you will find the full-screen key and the key simulation option for better input controls. 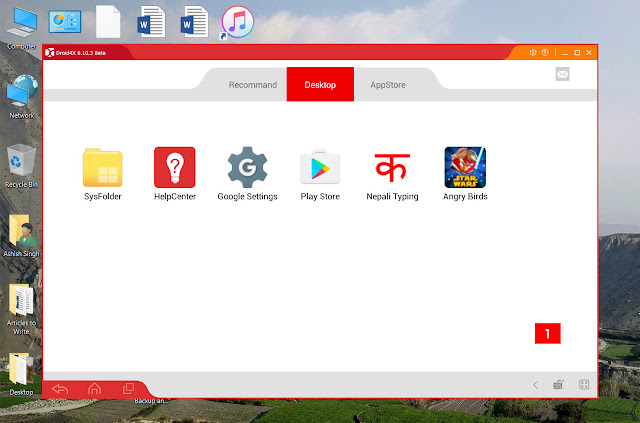 Install all the Android apps and games that you want and run them easily in your Android PC. If you have a touch screen laptop, then you’d be using it as a tablet. But there are ways to control the emulator using the keyboard and mouse. The important thing is that it runs all your favorite Android apps and games without any hassle. It also uses the Windows 10 notification system to notify us about things like installation processes. In the controls section, you will find three keys: (1) Back, (2) Home and (3) Recent. It’s present in the bottom left part. On the top right along with the standard window control buttons, you will find the settings and help menu. The settings menu is quite useful if you want to choose your hotkey, define what the minimize key does, set the screen resolution, volume, CPU. There’s even an option for external APK installation. That will cover you for a lot of things. Overall, the emulator or simulator as they call it is great. I’d use it over others now since it’s so much faster and responsive. On their official website, you will also find that you can use your Android or iOS phone as a controller for games and then use the Droid4X on your PC as a big screen game device. Gamers rejoice. So, give it a try and I think that mobile gamers who are looking for a bigger screen and better game controlling options will absolutely love it.